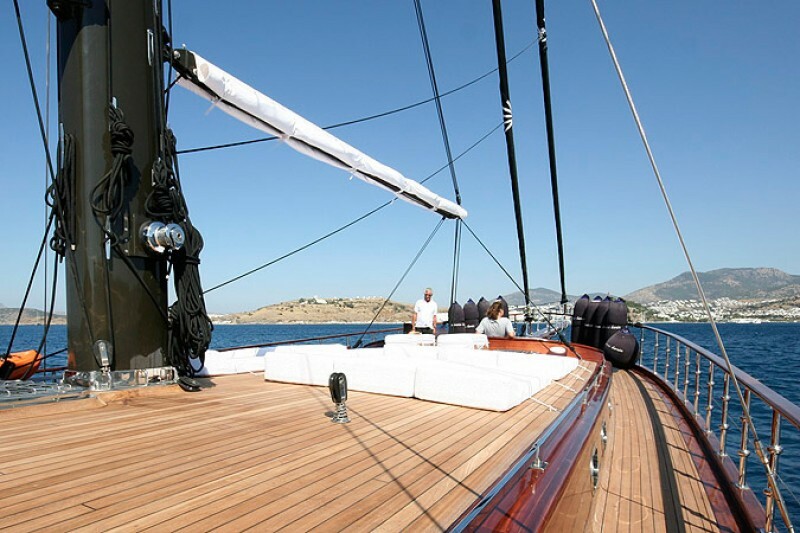 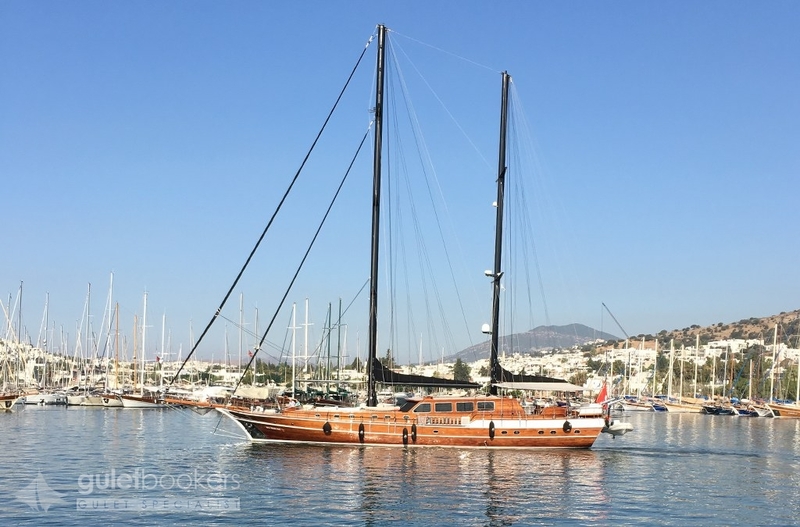 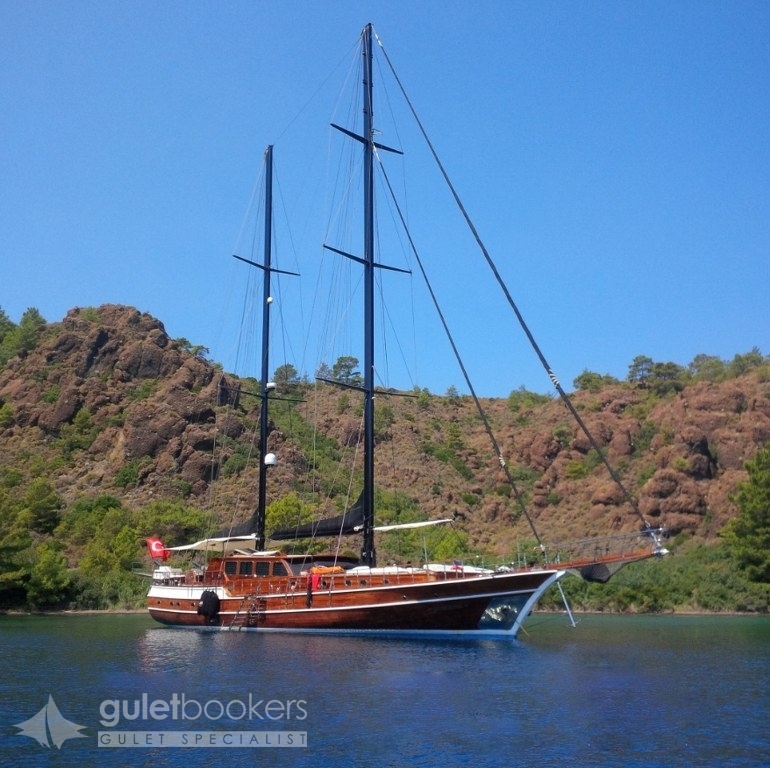 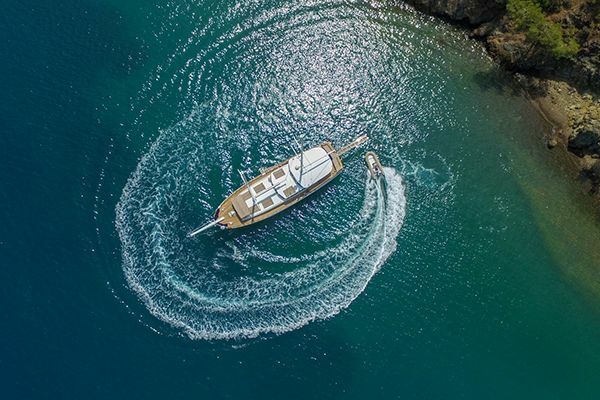 The high deluxe gulet Kaya Guneri Plus ( formerly named Princess Karia IV) is eyecatching in any bay, distinguished by her black masts, and black and white highlights to her elegant varnished timber hull and sails. 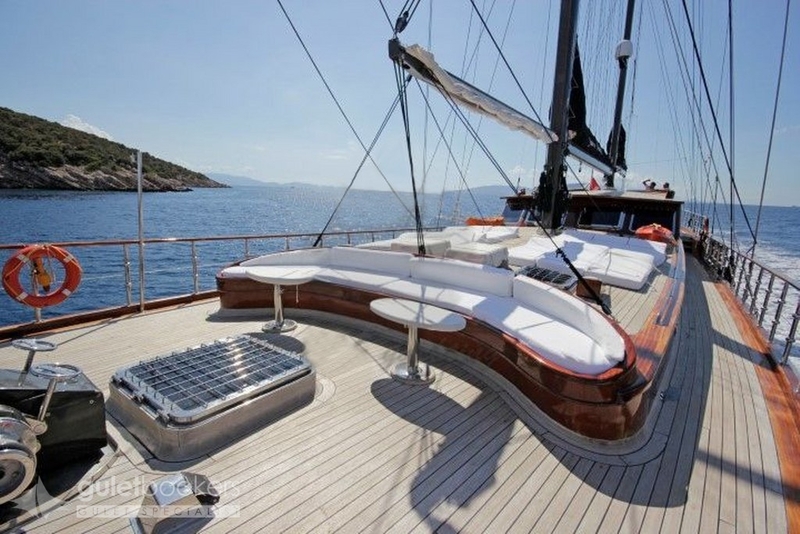 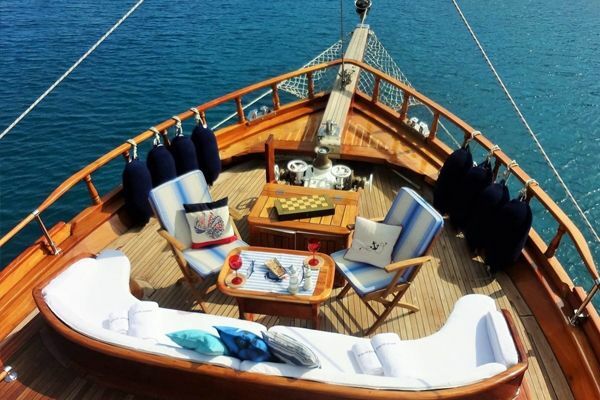 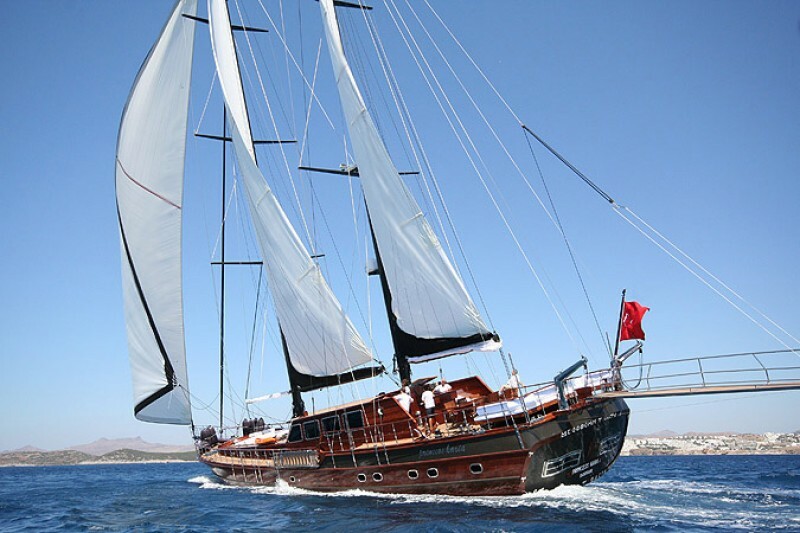 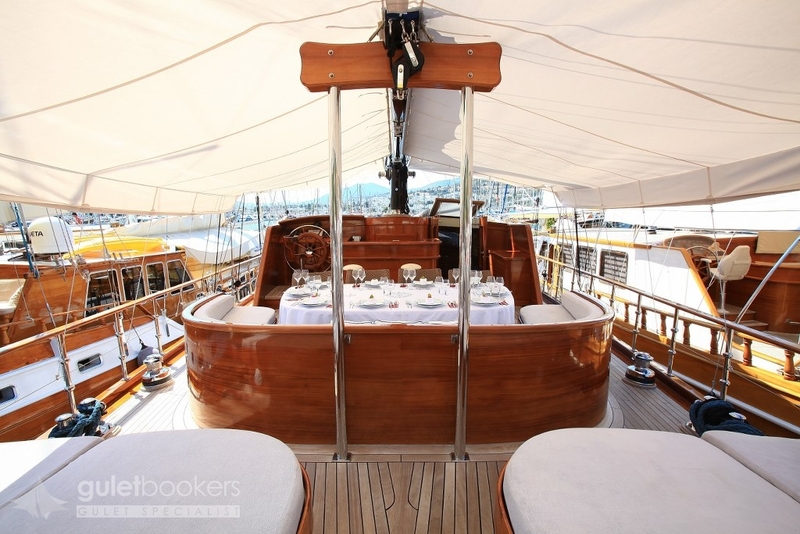 As a distinctive large sailing yacht charter for up to twelve guests, the Kaya Guneri Plus Turkish gulet has an ideal combination of two full beam width master cabins, plus double cabins, and double bed plus single bed combination triple cabins in a spacious, comfortable layout of three types of cabins forward and three aft allowing flexibility in accommodation for the guests. 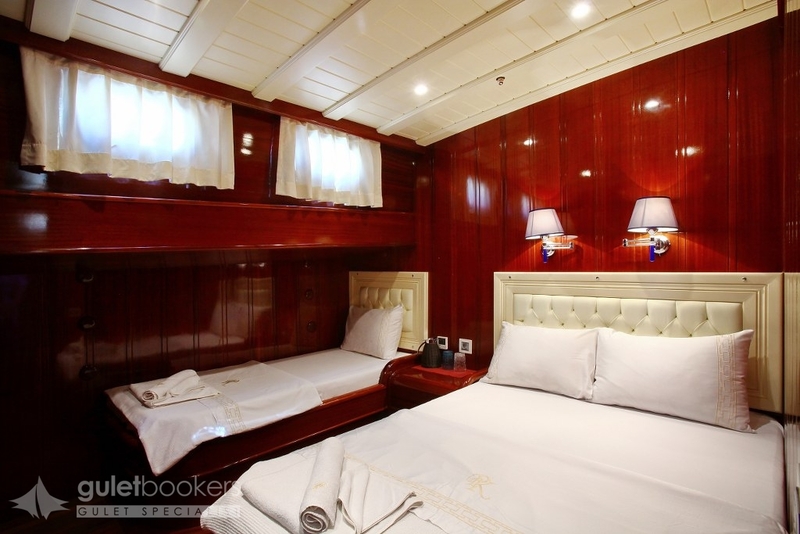 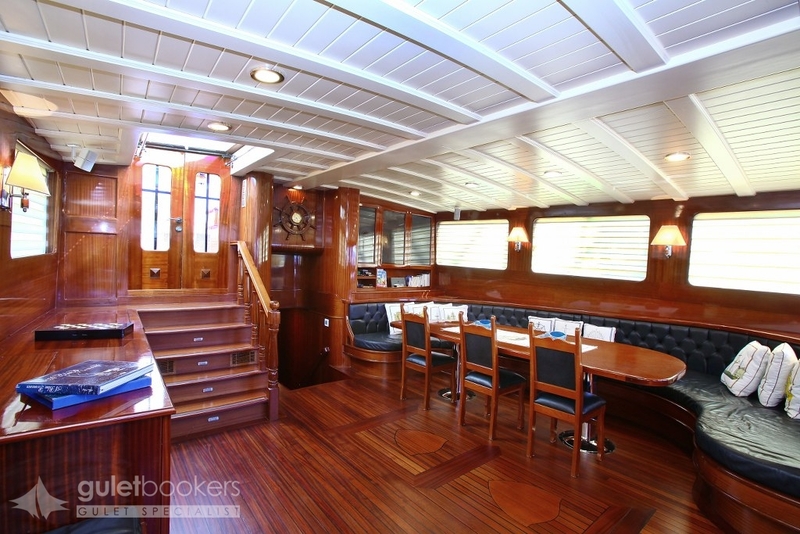 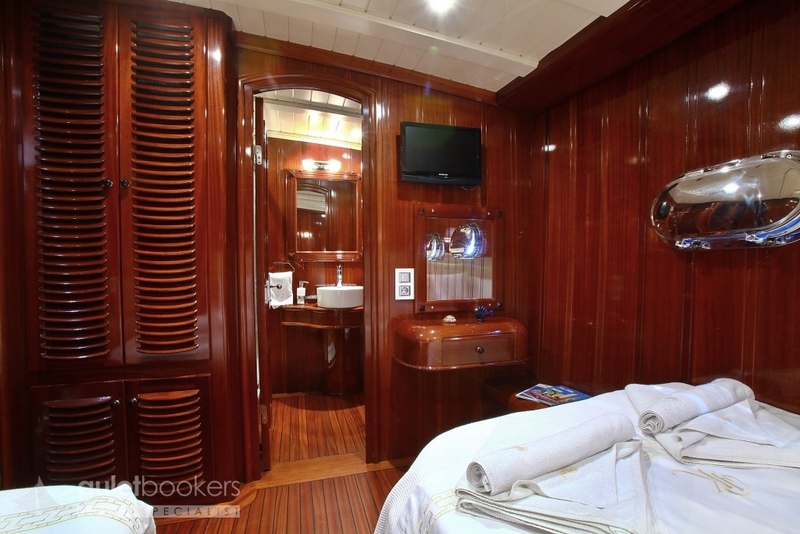 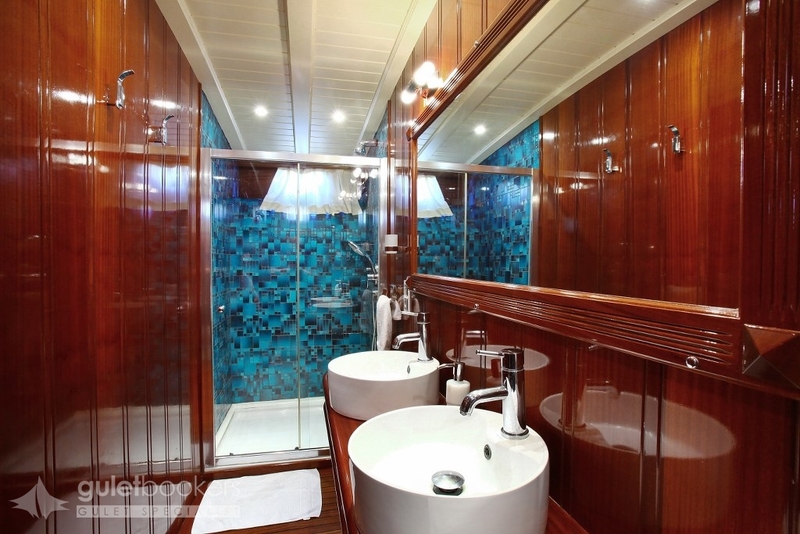 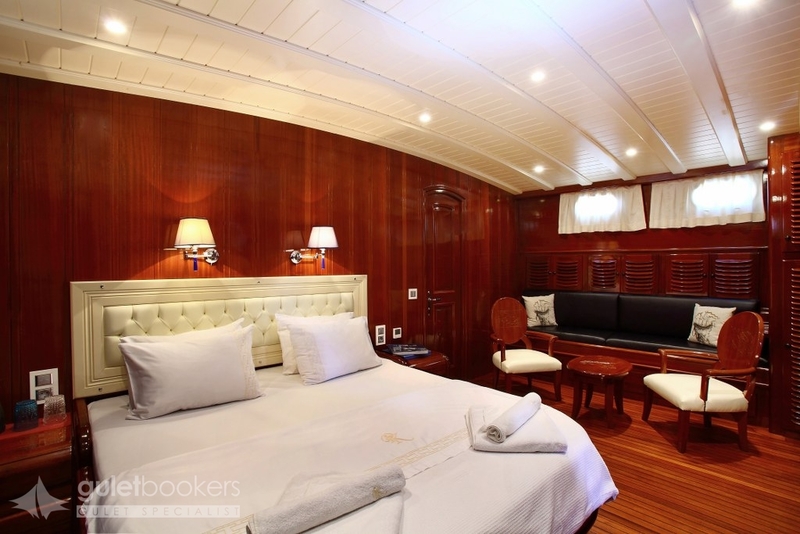 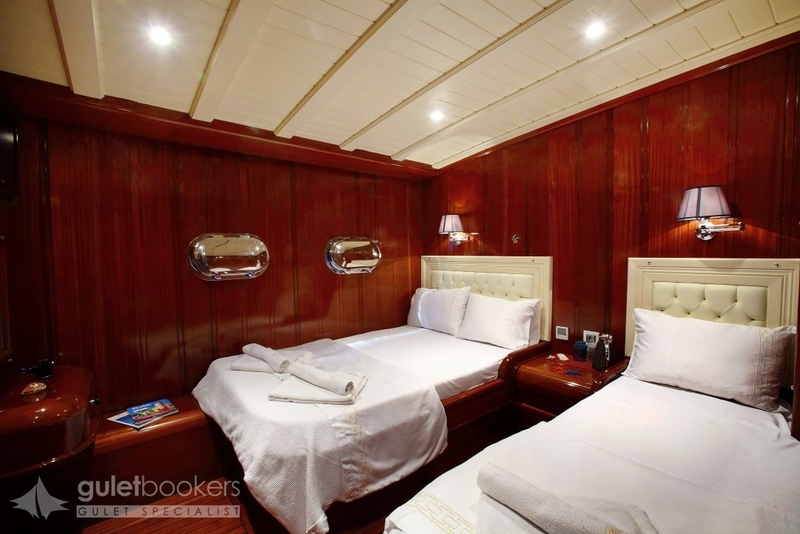 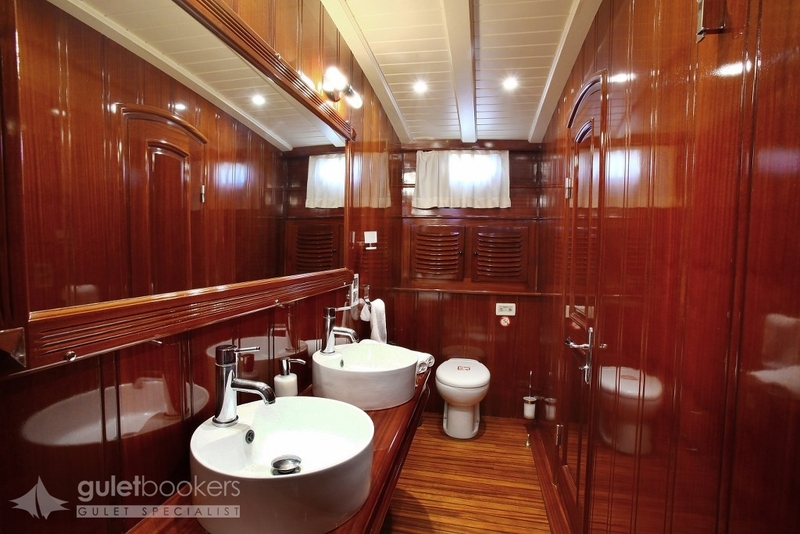 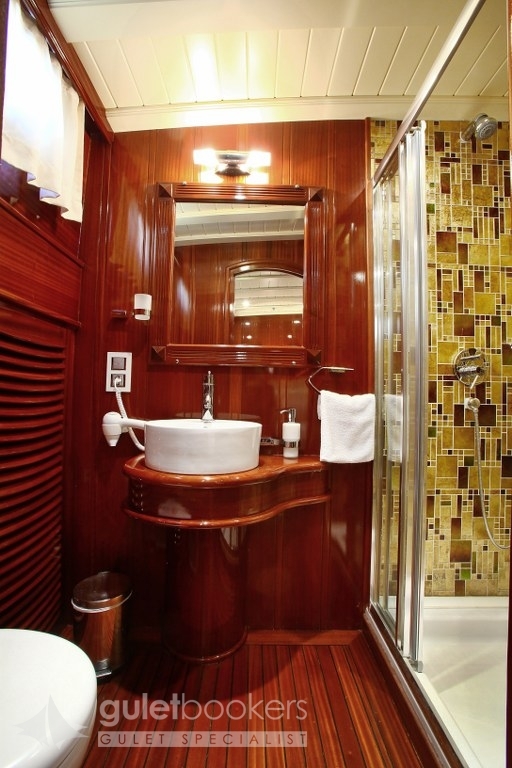 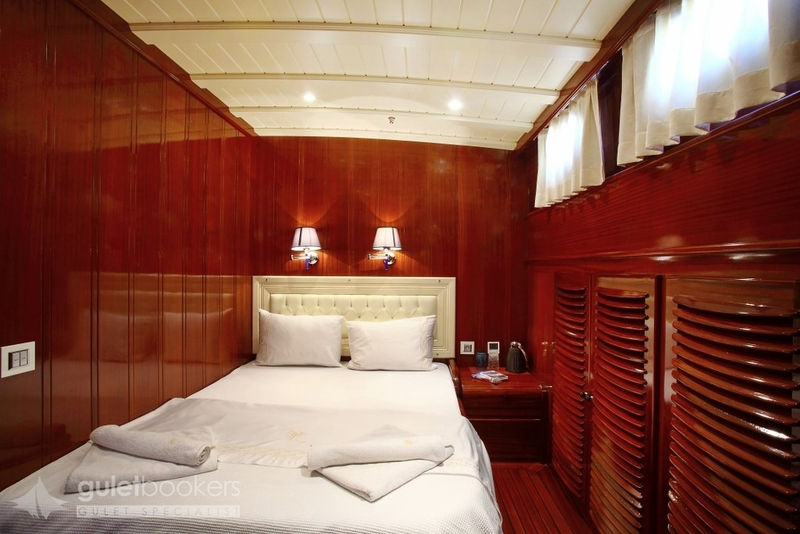 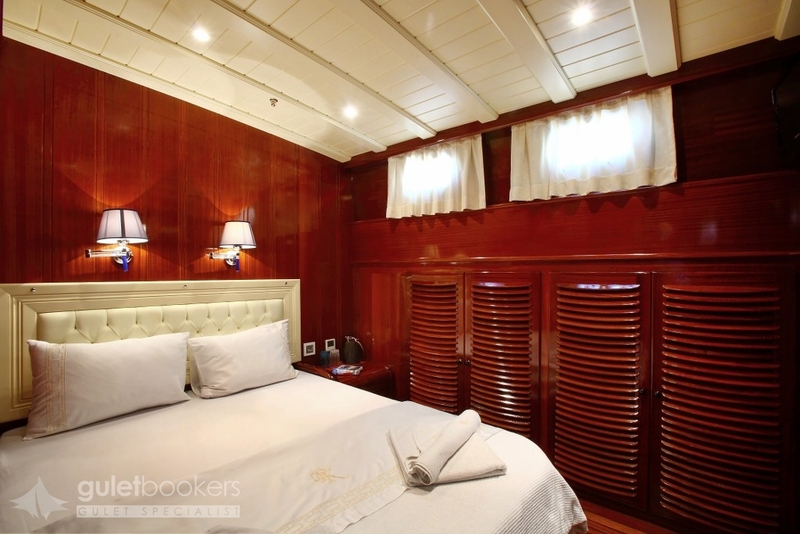 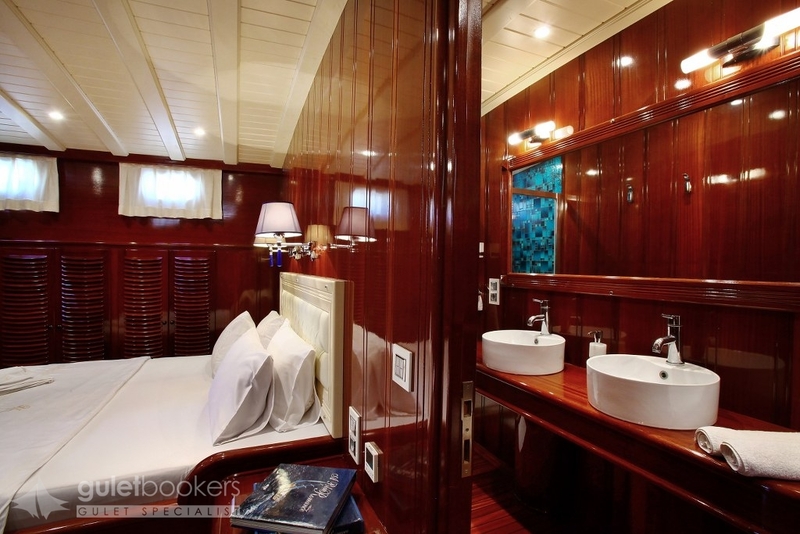 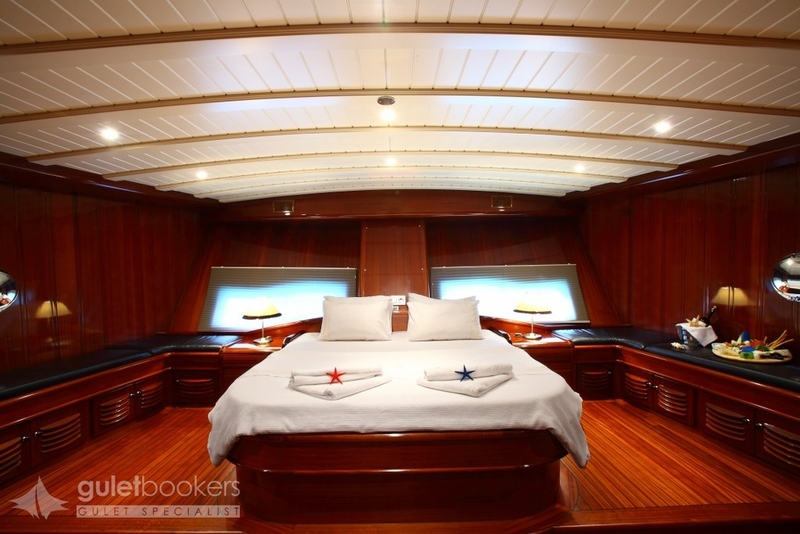 The lavish use of leather, mahogany, teak and other timbers throughout the gulet gives a stately, nautical club style, while the all thirty-four metres of hull affords generous space for the six cabins with all the luxuries and comforts of air-conditioning, TV/DVD and music system plus hairdryers, shower and WC in the well-appointed bathrooms.The saloon offers indoors entertainment with TV and DVD, and the technological comforts of home, and also an elegant dining table and leather upholstered seating for the option of indoor dining. 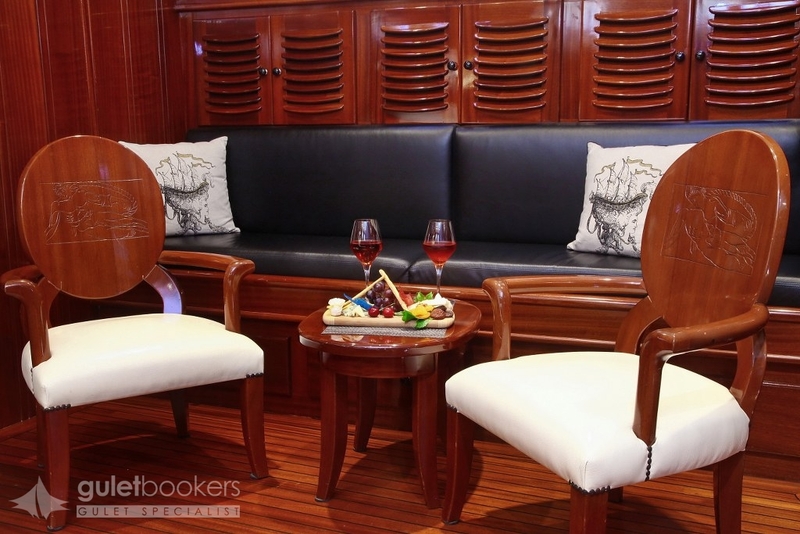 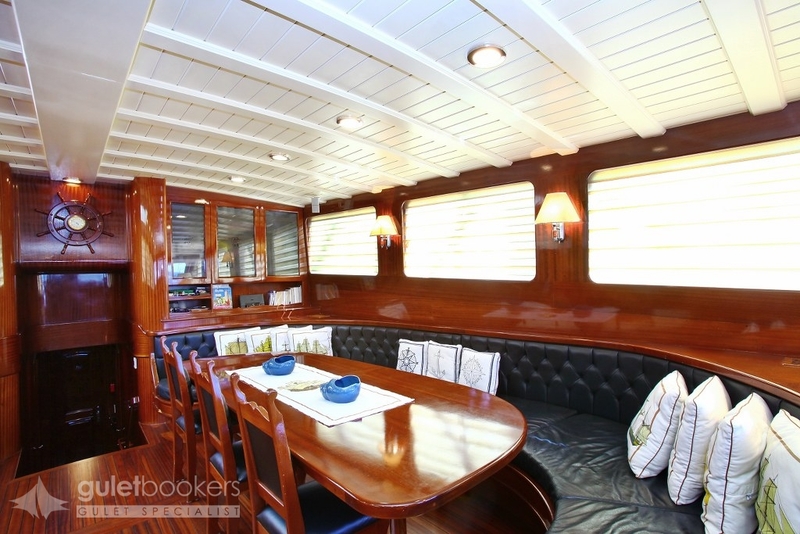 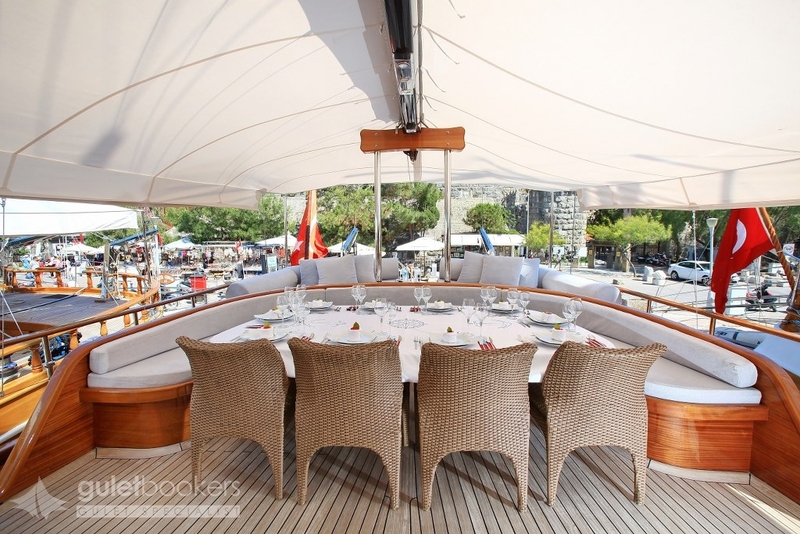 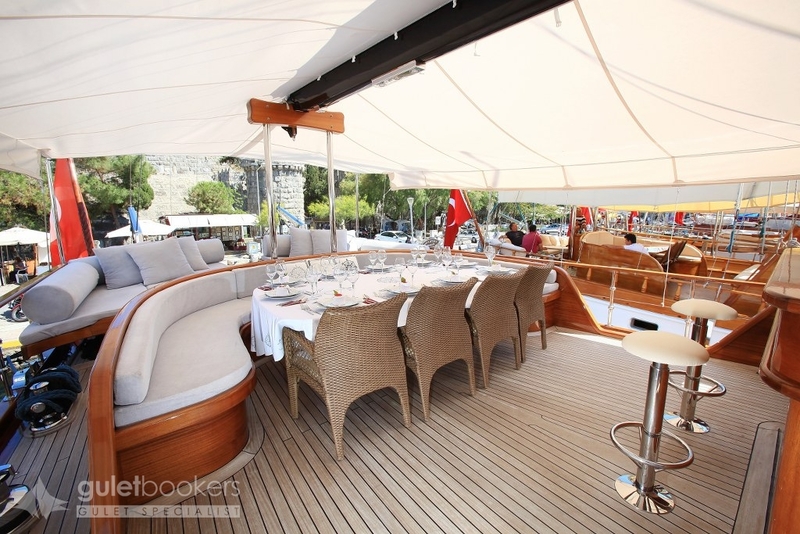 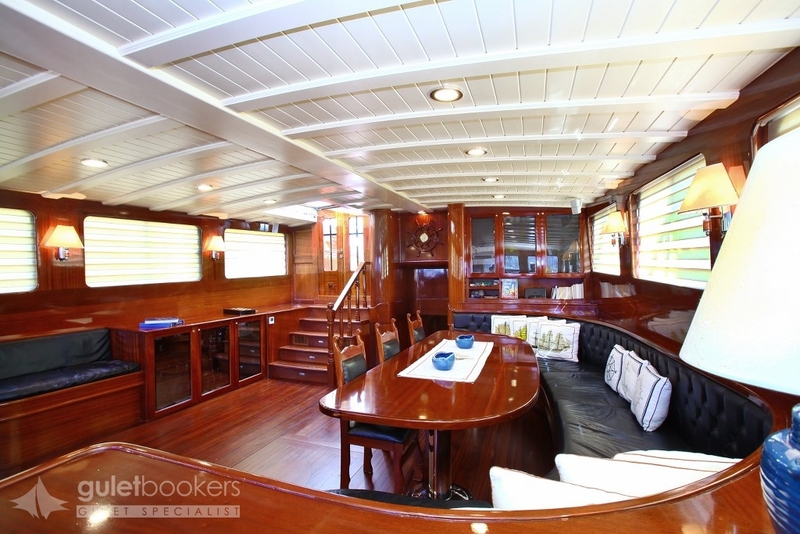 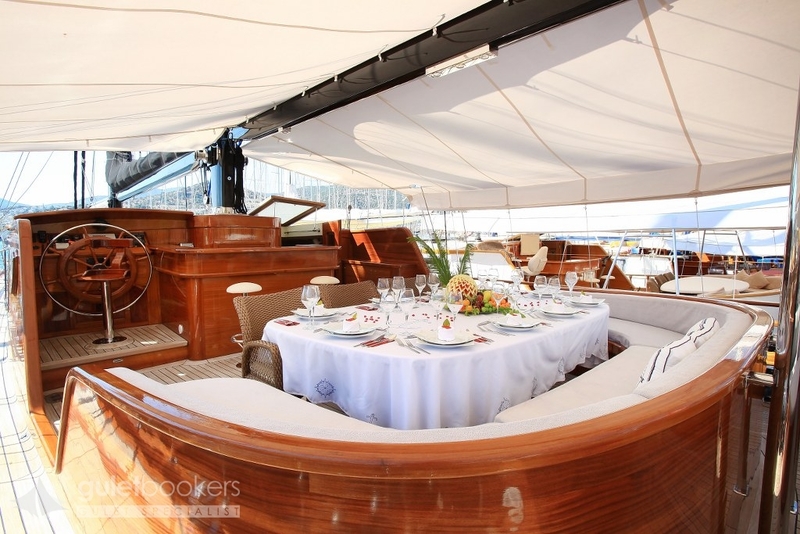 The outdoor spaces on deck are the most enticing places to spend a cruising holiday on the Kaya Guneri Plus with the aft deck’s wide cushions and the dining table inviting relaxed times under the awning, and more lazing space on ample sunbeds laid out on the sundeck forward , plus the very inviting bow seat with table, perfect for sunset drinks. 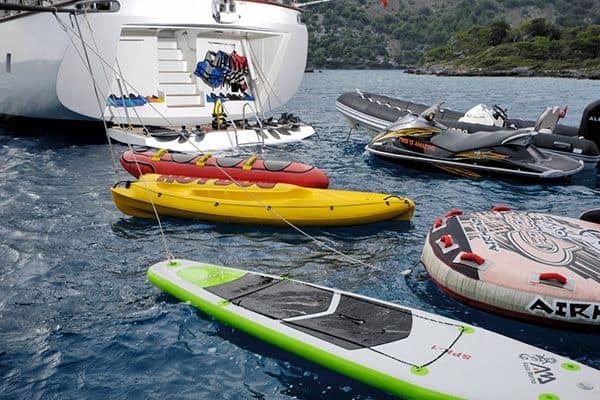 Activities such as snorkelling, canoeing and playing on the generous array of water toys can be a daily delight, as are walks on the shore and exploring the small harbours and villages near the pleasant anchorages the Captain finds each day. 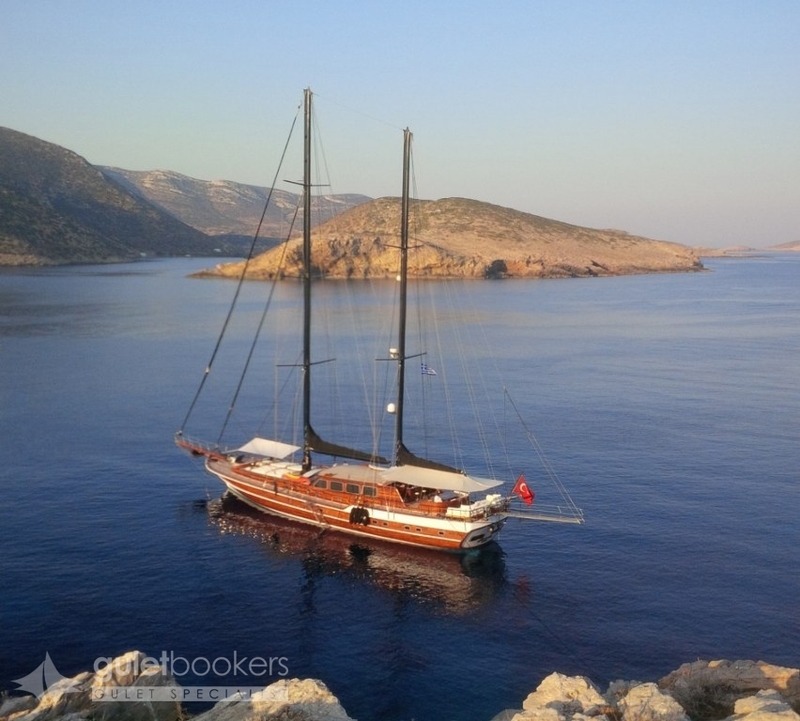 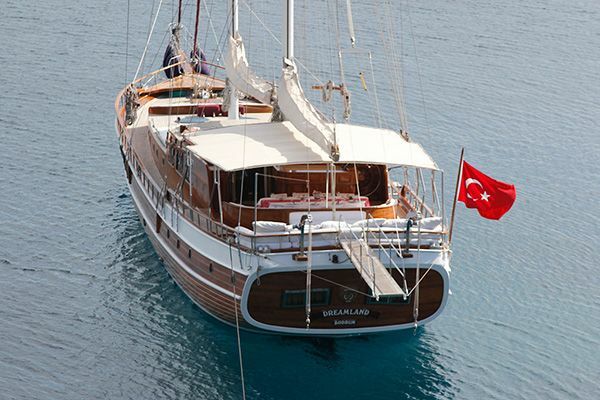 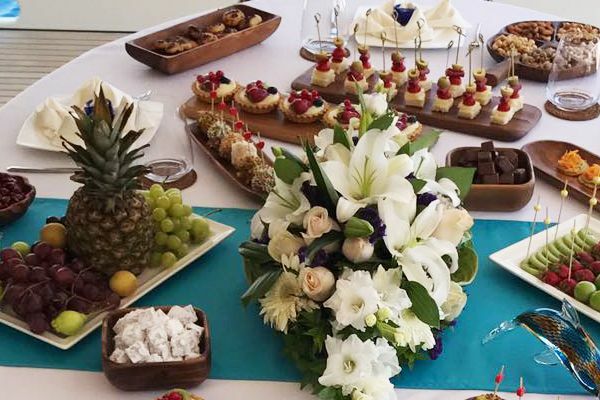 The Captain, chef and crew of three are professional and hospitable in attending to the guests, and local so are capable sailors who can set the full sail rig for very pleasant sailing and exploring of the Turkish Mediterranean Riviera, Aegean and amongst the Greek Islands.